Yesterday, Sabrina wailed about her wrist all afternoon long. We'd gone to a little carnival at her school; while she was scrambling around in one of those inflatable contraptions, she went down a slide and landed on her left hand. Sabrina's been going through a phase in which something seems to hurt every five minutes, so I had a bit of a girl-who-cried-wolf reaction. I gave her some Advil, but she didn't let up and that's when I started to worry. So after dinner, off to the emergency room we went. She wanted me to go with her; Dave stayed with Max. I dread hospitals. I doubt there is anyone who loves them, aside from bacteria, but I have a flash of post-traumatic stress anytime I'm in one. I think back to those two weeks Max was in the NICU and I can feel that mix of panic, worry, devastation and grief rise up in me. I picture Max lying in his incubator, hooked up to all the tubes. I see the face of the pediatric neurologist as he tells us that our baby has had a stroke. But the passage of time has helped, because for once I didn't picture anything Max-related when we walked in the doors of the E.R. I have a cold, and so the hospital scent didn't trigger a visceral reaction. I told the nurse at the front desk that I thought Sabrina might have fractured something so they fast-tracked us, which meant the entire stay only took about two hours, not bad for an E.R. visit. Sabrina was pretty chill except for when a technician took x-rays and made her move her hand a lot. It hurt to see her in pain. Sabrina broke a bone in her wrist. "The best kind of break, if there had to be a break," the doctor said, because it's the kind to heal quickly. Sabrina has a temporary cast on, and we'll be headed to the orthopedist to get a real one. "Is Max going to be up when we get back?" she asked several times as we headed home. The second the car stopped in our driveway, Sabrina flash-unbuckled herself, jumped out, ran into the house and up to Max's bedroom. "Maaaa-aaaaax, look what I've got—a cast!" she said in a sing-song voice. She'd been a little jealous of his serial casting this summer, and now it was her turn. Max studied the cast. "Ur-ul!" he said, and pointed to his own arm. He wanted a purple arm cast. I tucked him in, and then Sabrina. And we were all just fine. 2 hours in the ER? Sign me up! When dd was in that drama queen little girl phase of everything hurts, I used to tell her that whatever pain/ache/problem she had, a drink of water would solve it. 99% of the time it did! Speedy recovery to her! So sorry to hear about it. It must be hard to have those memories come back. (Plus, though my intentions were good, I feel a bit sheepish having nudged you to break out the new purse, because not only were you busy this weekend, but you were really busy--stuck at the hospital...Sheesh...I had no idea.) Speedy healing to Sabrina. What a cutie-pie she is. I hope you're feeling better, too. Hospitals are horrible but necessary places, aren't they? Omg. She has got to be the happiest kid with a cast I have ever seen! So glad it was as good a situation as possible under the circumstances! No worries, Anon. And yes, Jennie, hospitals are that weird combo of dreadful but lifesaving. "MOMMY, everyone at school asked me what happened!" "MOMMY, the teachers all had to help me close my folders because I couldn't do it by myself!" 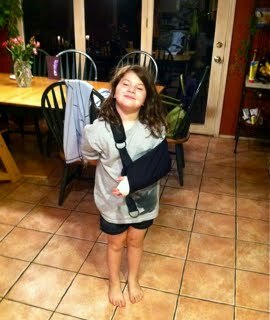 "MOMMY, do you think my sling needs to be tighter?" "MOMMY, do you think Max wants a cast like this?" OMG, we've been lucky. We're pretty thick-boned so nothing broken around here, knock wood. I am amazed at how calm you were, I probably would have been a wreck! While I hate it that Sabrina broke a bone, I have to admit that she is the cutest cast wearing girl I have seen in a long time. Margo and I called Sabrina last night to see how she was feeling, and she sounded pretty good on the phone. She actually sounded even cuter than usual. I somehow get the feeling that she almost "likes" the idea of having a cast. In any case, she is being a real champ about it.